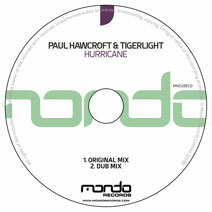 Continuing to unearth the finest summer anthems, we're super excited to welcome Paul Hawcroft & Tigerlight to Mondo Records with thier lush vocal offering 'Hurricane'. You'll instantly fall in love with this track thanks to its simple, yet effective groove and warm bass line in the intro. Easing you into the breakdown where the magic really happens, thanks to the lush vocals supplied by Tigerlight. The break packs in the warm bass, soothing vocals and the atmospheric melody notes, it will effortlessly lift you up ready for the drop and the main chorus to kick back in. Continuing to deliver the very finest in all things house, Mondolicious continues its global efforts to bring the best, the cream of the crop to the masses. Our next release comes ..